Explore our unique collection of diamond drop earrings. Discover a sparkling collection—full of grace, elegance and natural white diamonds. From chandelier drops to 3 stone diamond drop earrings, we have many styles to suit every taste. For additional designs enjoy our custom design service available for any diamond earring style. Captivating 3 stone trilogy diamond drop earrings, crafted with round brilliant cut diamonds in a drop style cluster design. Enjoy a choice of two total carat weight options - 0.18 carats or 0.42 carats, in a choice of precious metals including 18ct White Gold, 18ct Yellow Gold, 18ct Rose Gold and 950 Platinum. Each pair of 3 stone earrings are crafted to order and delivered beautifully packaged. Trilogy styled diamond earrings. Drop design with post. 3 equally sized diamonds in G colour and SI1 clarity. Choose from a range of different options. Free additional earrings backs for added security. Includes a lifetime warranty and detailed insurance valuation and free shipping to most countries Worldwide. Flow two stone diamond drop earrings, featuring graduated pairs of round brilliant cut diamonds, crafted in a sweeping earring design, crafted in a choice of precious metals. Two stone earring design. Choice of two carat weight options available. 0.80cts total diamond weight (4mm and 3.5mm diamonds) or 1 carat diamond weight (4.5mm and 3.75mm diamonds). Available in 18ct White Gold, 18ct Yellow Gold and 950 Platinum. Wood boxed, gift packaged. 3 weeks delivery time. Sophisticated, diamond drop earrings, adoringly crafted as part of the Laurel range, set with 0.15cts of grain set G colour VS1 clarity diamonds. Part of the Precious Platinum collection. 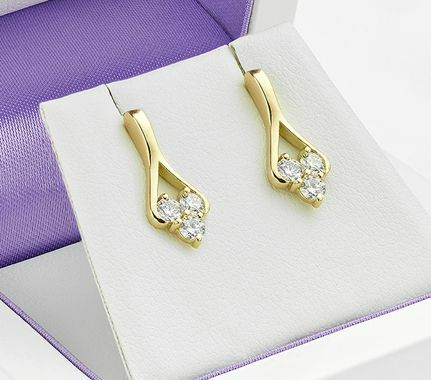 Laurel design diamond set earrings. 0.15cts total diamond weight. G colour VS1 clarity. Exclusively in 950 Platinum. Supplied wood boxed and gift packaged. 2-3 weeks for delivery. A waterfall of encrusted diamonds across a 3 stone trilogy earring design, with larger diamonds and pavé set links. 3 x 0.20cts (3.8mm) round diamonds in each ear along with 9 x 1.25mm round diamonds in each ear. Total carat weight 1.30cts for the pair. G colour SI1 clarity. 18ct White Gold. Drop design. Please allow 2 - 3 weeks for delivery. Decorative diamond drop cluster earrings, set with an oval diamond with a double halo two part earring design. SELECTED CARAT WEIGHT (RIGHT) IS JUST THE TOTAL WEIGHT FOR THE OVAL DIAMONDS. WE ADD 0.50cts of outer diamonds for the halo diamonds. 4 optional sizes available. Total carat weight choice from 0.95cts upwards.Please allow 3-4 weeks for completion and delivery. The drop style of earring tends to be one of the most popular styles, alongside the classic diamond stud earring. The design literally hangs from the ear, dropping from the lobe, and can be applied to many styles including single Pear shape diamond designs, to more elaborate multiple stone designs such as the three stone drop earring in the ever popular trilogy style. Whether the emphasis is on White Gold, or even Platinum, (such as the unique Precious Platinum Laurel Range) we have an exquisite choice. All orders tend to be created to order, with a timescale of around 2-3 weeks. We can, however, usually accommodate shorter time-frames, especially where we have finished earring mounts available from stock. Discover our full collection online, from simple chandelier drop designs to more elaborate diamond cluster drop earrings.